There have been sporadic, mostly peaceful protests in both entities of Bosnia and Herzegovina for more than a year now. 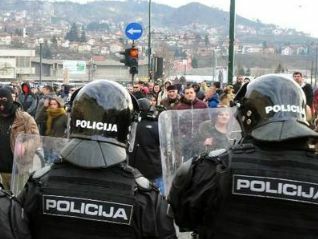 The recent ones turned violent mainly because of the ruthless reaction by the police to initially peaceful protest in Tuzla. Those developments illustrate three things: general dissatisfaction of the population, the lack of institutional means of expressing them, and the unbelievable arrogance of the many governments and of the powerful; therefore, resentment, lack of responsiveness, and arrogance combine to make the streets the only place where issues can be argued. The lack of economic improvement is of course in the background 1, but the political stalemate is the main reason. The trigger are the upcoming elections in October, which provide an opportunity for new political actors, parties and people, to come to the fore. Already the current regime is collapsing in a number of towns and cantons of the Federation of Bosnia and Herzegovina (one of the two entities) while the opposition has been gaining support in Republika Srpska (the other entity). The main challenge going forward will be to avoid the rhetoric, coming mostly from the government in Republika Srpska, that these protests are an international complot to bring down their president, Milorad Dodik. The international response has been somewhat confused at the beginning, but seems to be more helpful recently. There is growing support for the peaceful protests in both Brussels and Washington while the Serbian government is calling for an electoral resolution to the grievances. There are also a number of resignations in various cities and cantons in Bosnia and Herzegovina and more of those would be helpful. In addition, the police is showing decreasing readiness to resort to violent means against the protestors, which is certainly helpful. The key issue is whether these protests will lead to the willingness of the new leaders that might emerge after the elections to start a process of normalisation of Bosnia and Herzegovina and of the change of its constitution. This policy the international actors should support and, more importantly, the regional actors, Croatia and Serbia, should not only support but also strongly suggest as being very much in their own interests. The institutional set-up of Bosnia and Herzegovina needs to change to enable democratic decision-making, responsiveness and accountability. 1 More on the economic developments in Bosnia and Herzegovina and in the whole region in the upcoming wiiw Forecast Report. On the sorry state of the employment, especially among the young, see our report 'Hard to Enter: Young in SEE Labour Markets'.